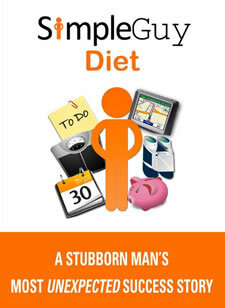 The Man Diet is found in the book, The Simple Guy Diet and is written by a self-described “pathetically average 50-something male”. He wanted to lose weight but had no interest in joining a diet club or following a complicated program so he decided instead to focus on making some simple dietary adjustments. After six months he lost twenty pounds with virtually no effort and his friends and co-workers started asking him for his weight loss secrets. So he decided to make this man diet available online for a small fee just to cover the cost of the investment in his website. Regular weighing can keep a man motivated to make better food choices. A complete diet program is not included but some general tips are provided. Men Dieters are encouraged to avoid white foods (rice, potatoes, bread etc. ), soft drinks, fried foods and desserts but treating themselves every now and then is perfectly acceptable. A man should have fun discovering his own solutions to healthy eating and emphasize simple food choices that fit into his lifestyle. A Man doesn’t need to buy expensive diet food or supplements and he is encouraged to search for ways to save money while following a healthier man diet. The author says that a man doesn’t have to kill himself with exercise and he promises a no-sweat solution to get men moving. Salad, steamed vegetables, baby carrots, apples, raw almonds, walnuts, oatmeal, Grapenuts®, 1% milk, yogurt, tuna, chicken, meat, eggs, red wine, dark chocolate. Walking is the recommended form of exercise for this man diet and the author suggests multi-tasking while a man walks such as listening to an audio book or planning his week ahead. He also encourages doing more lifestyle physical activities such as yard work, physical chores or playing with the kids. The Simple Guy Diet is available for $12.99. Also recommended is the purchase of a digital scale. Simple approach to weight loss. Will appeal to male dieters. Very inexpensive compared to other man diet programs. Regular weighing has been associated with a greater chance of success. Dieters make the choices that fit into their lifestyle. Is not a comprehensive weight loss plan. Requires the purchase of a digital scale. The Simple Guy Diet is a commonsense approach to dieting that will appeal to male readers and dieters who don’t want to follow a structured weight loss plan. This man diet does not provide a meal plan or detailed dietary guidelines but instead encourages men to discover their own way of eating and living healthy that will naturally result in weight loss over time.